Baby Theo Eastment wasn’t due until the 20th of June this year so when his mum, Hayley woke up with pains on a snowy morning in March, it didn’t even occur to her that she could be in labour. At only 26 weeks pregnant, Hayley admits that she hadn’t even known it was possible to have a baby that soon. After a few hours, the pain wasn’t going away, and as they seemed to be coming and going regularly like contractions, Hayley and Mark decided to get checked at the hospital. They were given reassurance that Hayley was probably just experiencing normal pregnancy pains but while waiting to be discharged her water’s broke. The ward staff injected Hayley with the steroids usually given to a woman in premature labour to protect the baby’s lungs and brain, but it was too late. Theo was born 20 minutes later, more than 13 weeks early and weighing a tiny 880g. 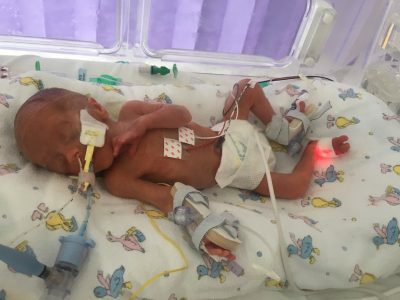 “We were allowed to go and see Theo on the neonatal unit a few hours later and even though I was still in shock and distraught at the situation, I can remember thinking when we walked in how incredible the place was. I had no idea it existed! Theo’s condition remained stable for a few days and he started to open his eyes and move a little more. On the fourth day the medical team tried Theo on a slightly less invasive form of breathing support called BiPAP. But after only a few hours he began to struggle and he was put back on the ventilator. On the same day, Hayley and Mark were given the devastating news that a bleed on Theo’s brain which had originally been classed as low risk, was in fact a level four – the most severe grade bleed possible and that, if any swelling developed he would need emergency brain surgery. If Theo survived, it was also very likely that he would develop some form of disability as a result. But as the hours progressed, it was Theo’s lungs that became the biggest cause for concern. Theo’s oxygen dependency increased rapidly until not even the ventilator could support his needs anymore. The only option was to transfer Theo to an oscillator – a high frequency form of ventilation that keeps the lungs permanently open. But, still, despite receiving 100% oxygen, the levels in his blood struggled to stay at 90. Thankfully the new course of steroids started to work and over the next week, Theo improved and on the 16th day Hayley was able to hold her son for the very first time. Mark had his first cwtch the following day but as he was still holding him, Theo’s alarms went off and his levels plummeted. Over the next few hours Theo’s condition, despite the ventilator and steroids, continued to deteriorate. The only option left was a stronger steroid that carried a risk of further brain damage. Theo was started on the new course of steroids and placed back on the oscillator on 100% oxygen. But despite the progress Theo had made, he was by no means out of the woods. Each attempt to reduce his dose of steroids failed, he was still on intensive care 13 weeks on and Hayley and Mark were warned that if Theo’s lungs didn’t grow, within a few months there would be nothing more that could be done for him. Just before what would have been his due date, Theo had to undergo an operation to correct a condition called ROP (Retinopathy of Prematurity) which can cause blindness in very premature babies. Despite returning to the ventilator for a short while after his eye operation, he was doing well and moved quickly down the stages of ventilation. Mark says “Theo was getting stronger and more aware by now and he hated having the mask and prongs on his face. He constantly tried pulling them off and we sat there all day putting them back on his face so that he could have the oxygen he desperately needed. 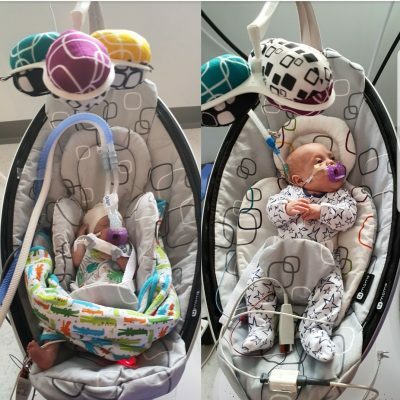 But by his due date he was stable enough to move to a nasal cannula It got to the point where he was close enough in stability to try him on High Flow, which was a nasal cannula which made him instantly more comfortable. We were so excited to see more of his face and to start seeing some progress”. After more than 100 days on intensive care, Theo graduated to the high dependency unit. But a month later Hayley and Mark were told that an investigation to check on the severity of his reflux had uncovered a different unrelated issue. Theo had a problem with his intestine that, though nothing to do with his prematurity, was potentially lethal. He was being rushed to surgery immediately. As it turned out, the operation on Theo’s intestine was more of a success than anyone could have hoped because after that, for no fathomable reason, his breathing became easier too. At nearly six months old, and now affectionately known as the Grandad of the neonatal unit, Theo moved on to Island ward at the children’s hospital where he surprised everyone by graduating quickly on to the lowest form of ventilation called low flow. 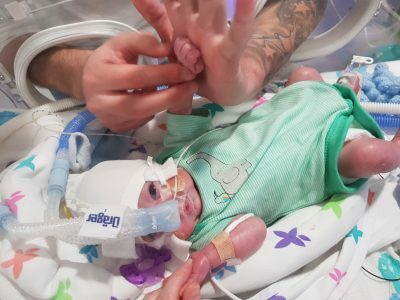 This was the best news possible for Hayley and Mark because it meant that Theo’s lungs were growing and developing – the vital information that they’ve been longing to hear. On 20th September just over 6 months after Hayley and Mark arrived at hospital for a check, they finally got to take their baby home. But after only nine days Theo became unwell with blocked bowel caused by scar tissue from his first surgery. Surgery was a success and Theo was admitted to PICU on the ventilator whilst he recovered. Hayley and Mark were told that he was stable and that they would try to get him off the ventilator the following day. But for no known reason, Theo deteriorated rapidly. Hayley says “We so were relieved that the operation had gone well and were pleased to know that we might be going home in a few days. But only 12 hours later we were told that his body was reacting very badly to something and they couldn’t understand why his lungs needed so much support”. Two days after the surgery, at 3.30am, Hayley and Mark received the phone call telling them to go to PICU immediately. After 25 minutes Theo’s heart started beating again, but he was in a very serious condition. Hayley and Mark were told that Theo had received CPR for a very long time meaning that his brain may have been starved of oxygen and that there was a very high chance of him being brain dead. Day by day Theo made a miraculous recovery and within only 10 days he was back on low flow, awake, smiling, laughing and back to himself. 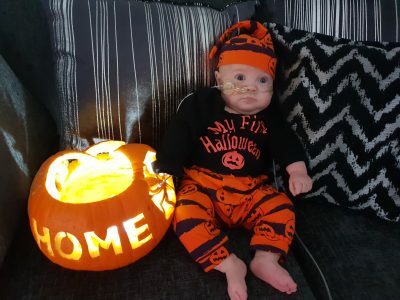 It took a further two weeks to successfully wean him off all his sedation and Hayley and Mark were finally able to take their son home again on 26th October, where he continues to thrive. Hayley says “We just can’t believe he’s still alive and we feel so lucky that he has been given this second chance at life. Theo still has severe chronic lung disease but in time, as he continues to grow, his lungs will become stronger and he will need less oxygen support. He also has issues with sickness and feeding and we know that we have a long road ahead of us with his development but we are just so grateful that he is here with us. He is such a strong boy and is doing fantastic considering his start in life. He constantly surprises us and the medical team. No matter what is thrown at him, he comes through and I just don’t know how he does it. We’ve spent over 7 months in hospital this year which has been very difficult but we find our strength in him and we are so pleased to be home”. Theo was among the first to use a Baby Leo, a state of the art incubator reserved for the most critically unwell babies. The unit’s new DR X Ray Machine, funded by the Morrisons Foundation as part of the Tiny Lives Appeal allows X-Ray images to be taken without moving a baby and gives instant results digitally.